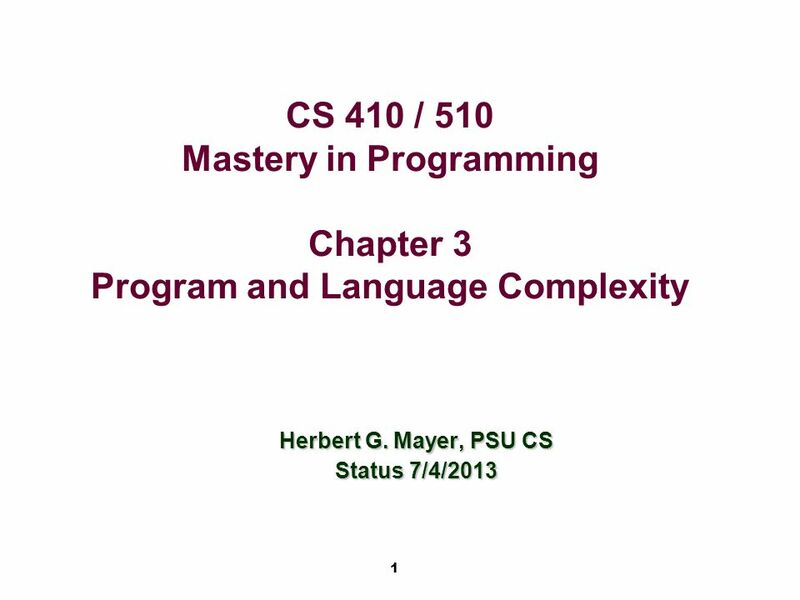 1 CS 410 / 510 Mastery in Programming Chapter 3 Program and Language Complexity Herbert G. Mayer, PSU CS Status 7/4/2013. 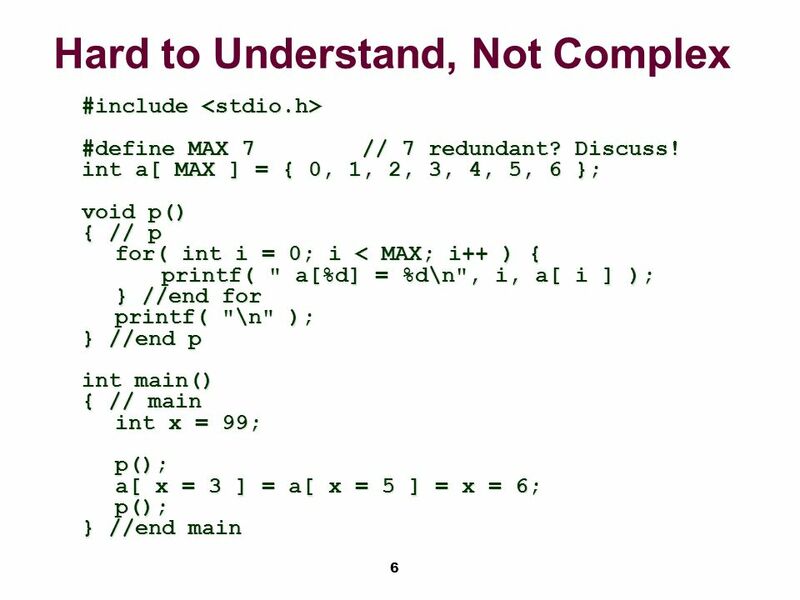 5 5 Hard to Understand Code? 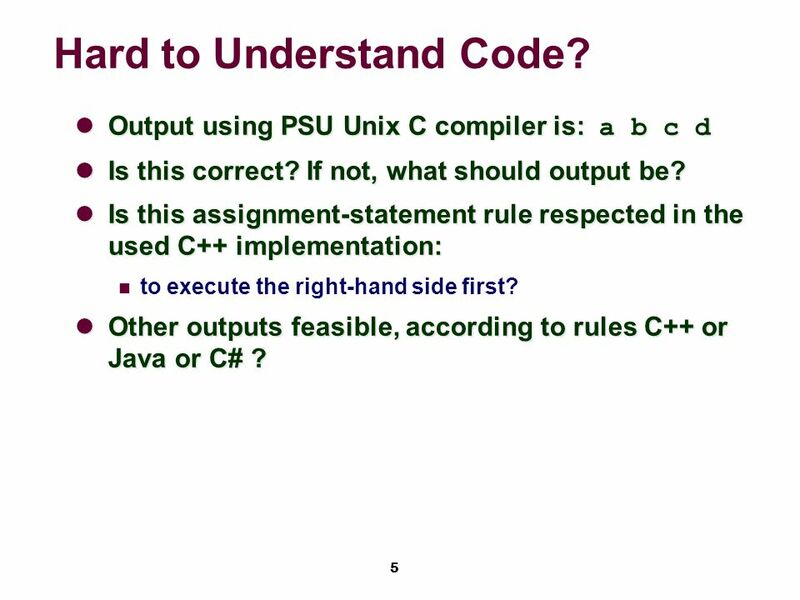 Output using PSU Unix C compiler is: a b c d Output using PSU Unix C compiler is: a b c d Is this correct? If not, what should output be? Is this correct? If not, what should output be? 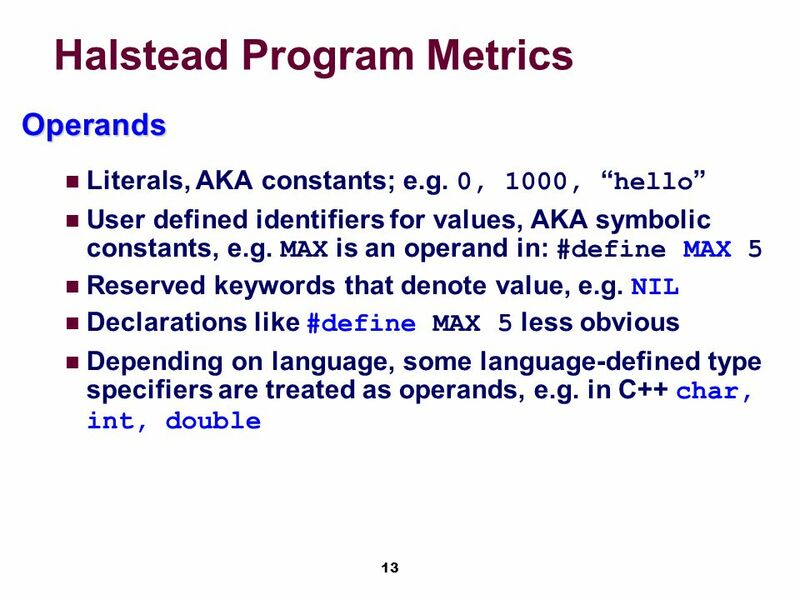 Is this assignment-statement rule respected in the used C++ implementation: Is this assignment-statement rule respected in the used C++ implementation: to execute the right-hand side first? Other outputs feasible, according to rules C++ or Java or C# ? 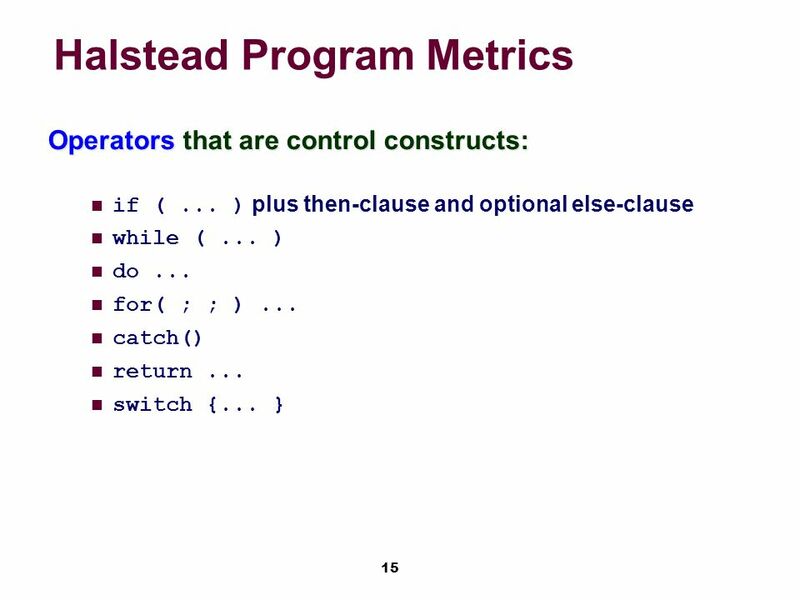 Other outputs feasible, according to rules C++ or Java or C# ? 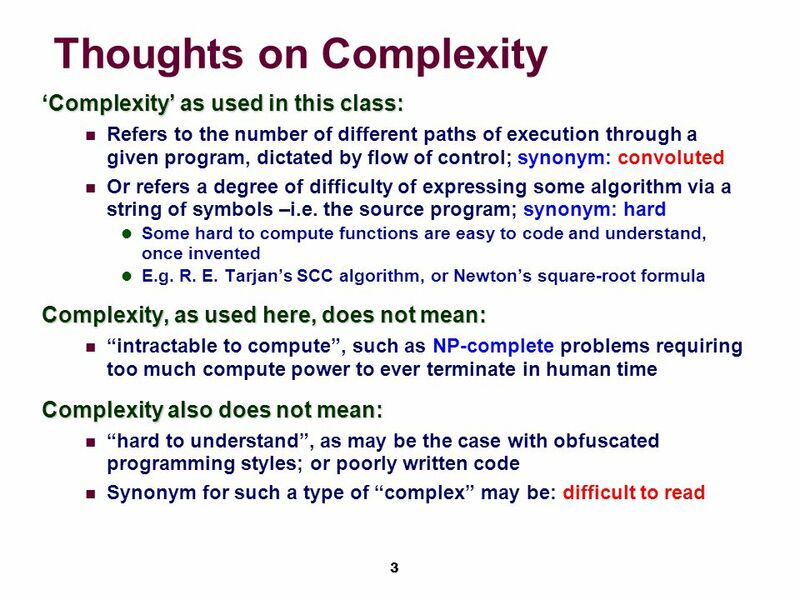 8 8 Program Complexity Some computable problems are hard, NP-hard, complex, or hard-to-understand! 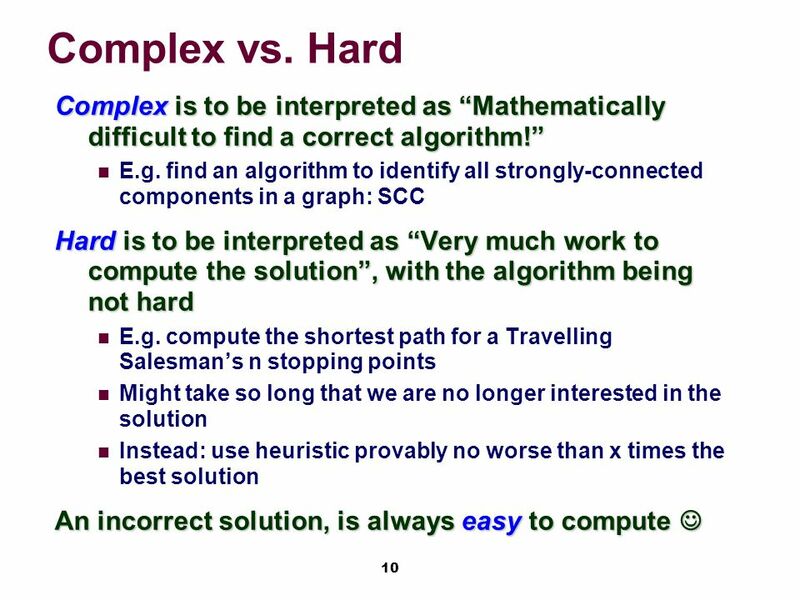 Assuming an experienced designer and programmer: Some problems are laborious to solve; they are “complex” due to amount of work Others are hard, due to elusiveness of a solution; just try to find a better SCC!!! 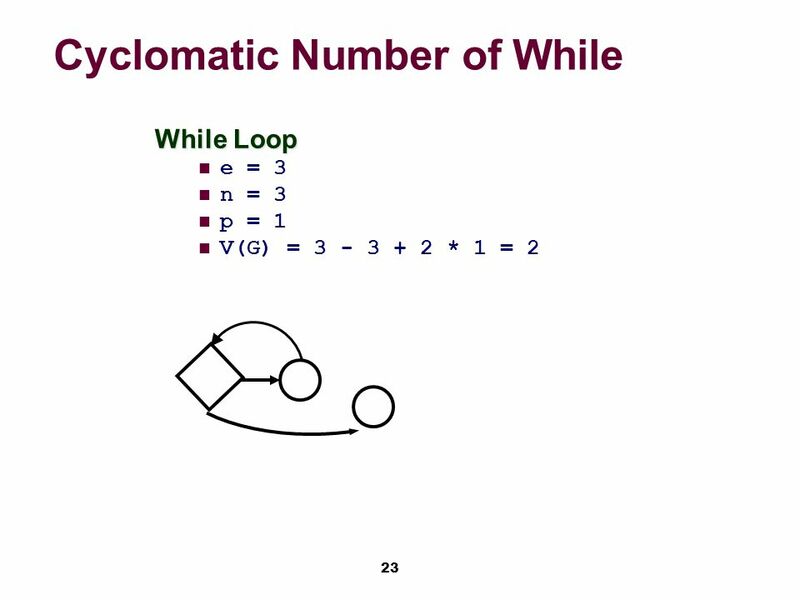 Yet others are not solvable; e.g. 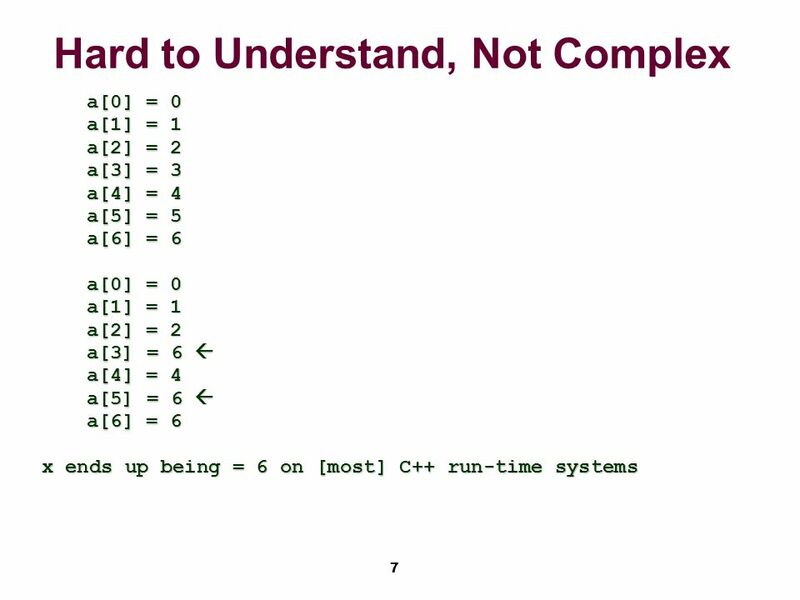 non computable functions, e.g. 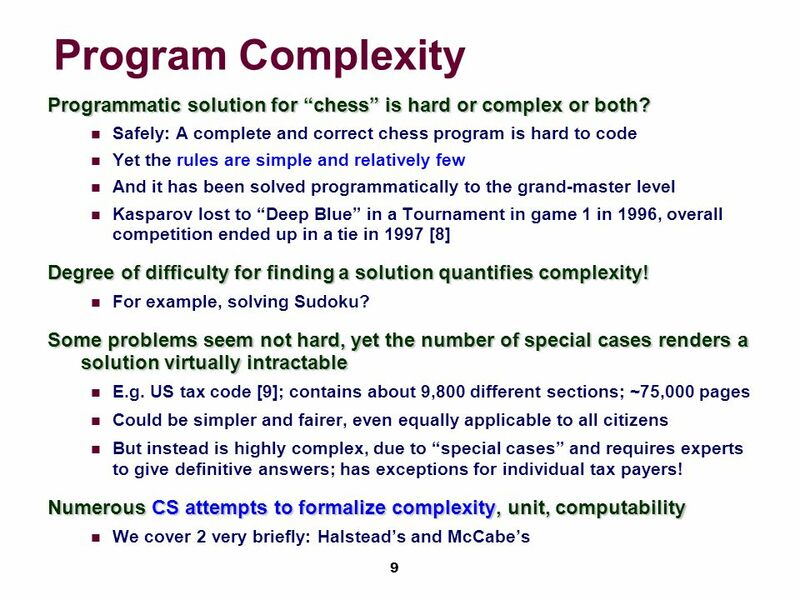 Halting Problem  What is program complexity? 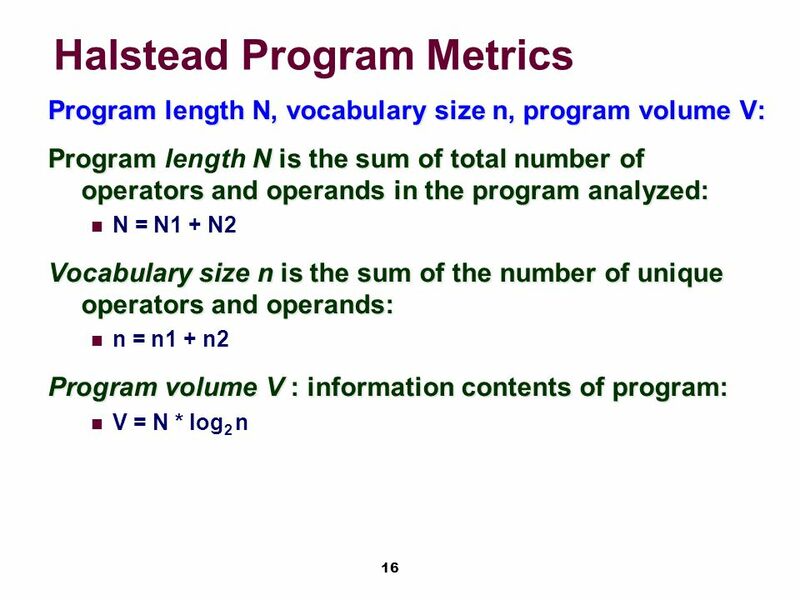 Is a large program complex, i.e. 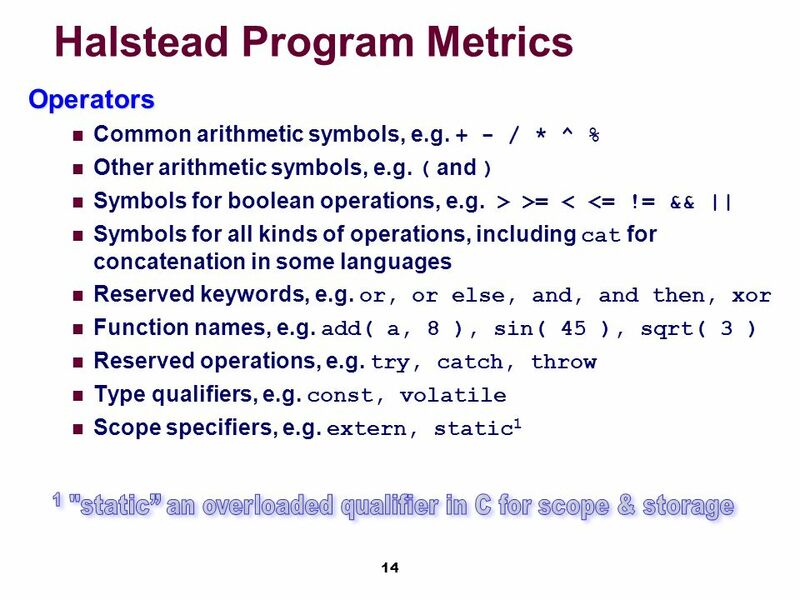 one with many lines of code (LOC)? 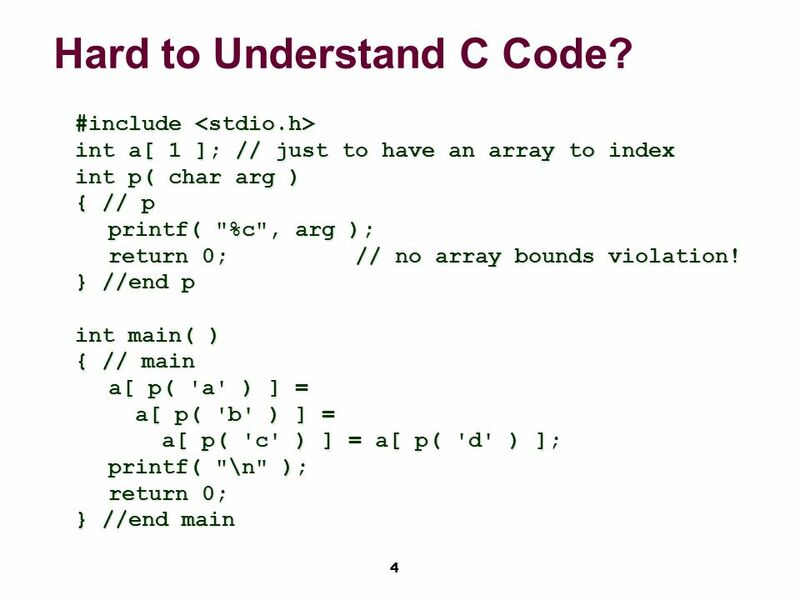 More complicated code? Spaghetti code? Labels? Computable labels? Gotos? Poor naming conventions? Recursive functions? 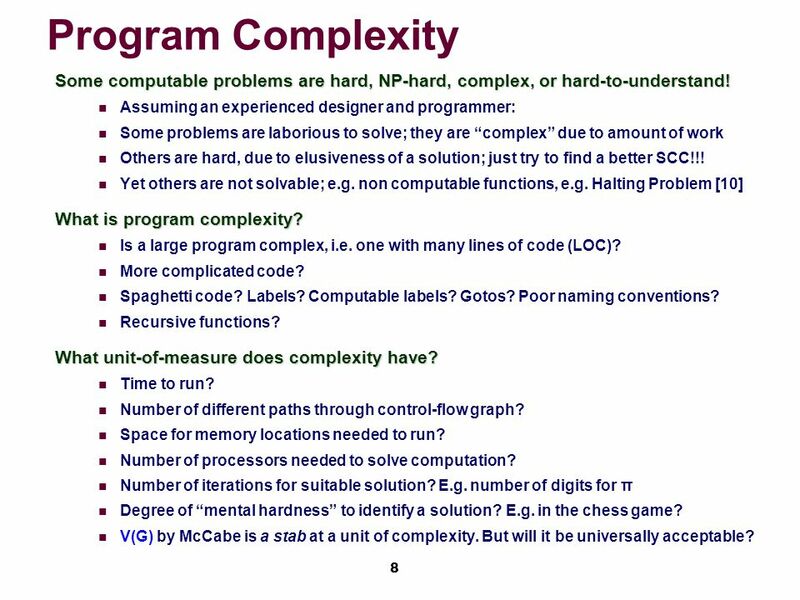 What unit-of-measure does complexity have? Time to run? Number of different paths through control-flow graph? Space for memory locations needed to run? 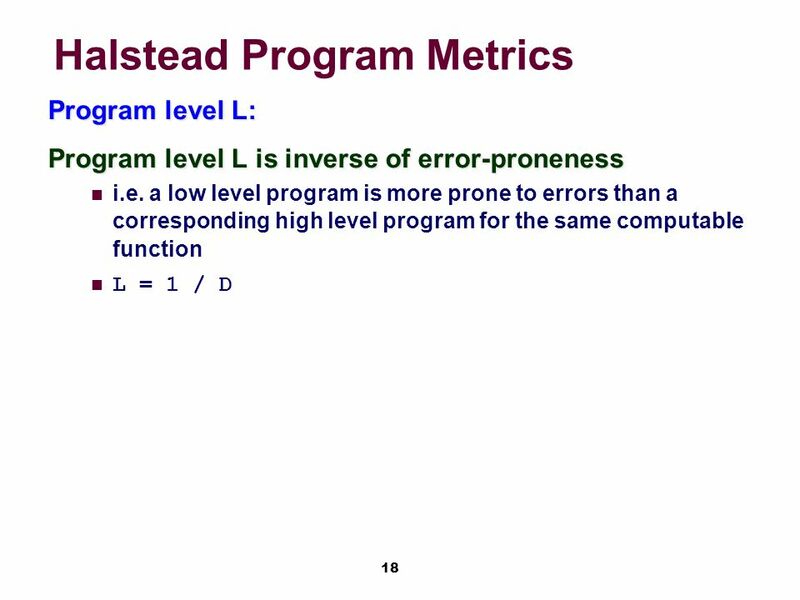 Number of processors needed to solve computation? Number of iterations for suitable solution? E.g. number of digits for π Degree of “mental hardness” to identify a solution? E.g. in the chess game? 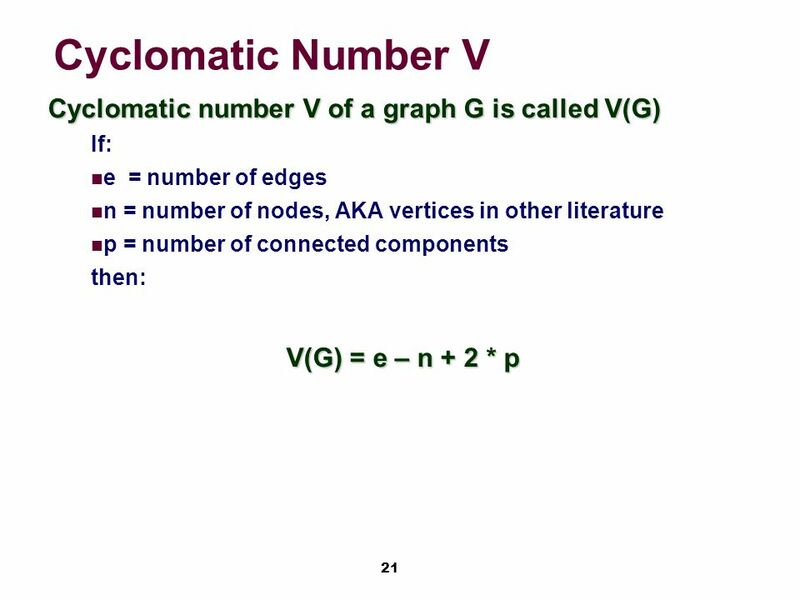 V(G) by McCabe is a stab at a unit of complexity. But will it be universally acceptable? 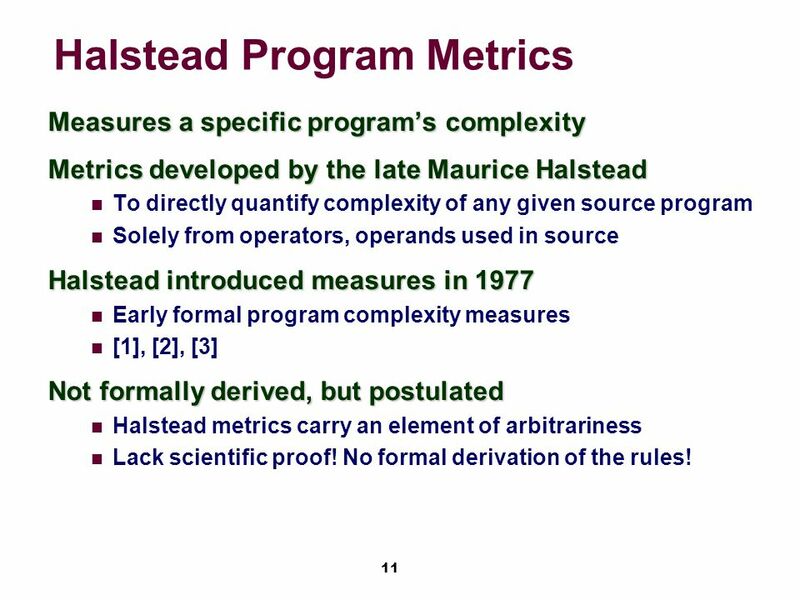 11 11 Halstead Program Metrics Measures a specific program’s complexity Metrics developed by the late Maurice Halstead To directly quantify complexity of any given source program Solely from operators, operands used in source Halstead introduced measures in 1977 Early formal program complexity measures , ,  Not formally derived, but postulated Halstead metrics carry an element of arbitrariness Lack scientific proof! No formal derivation of the rules! 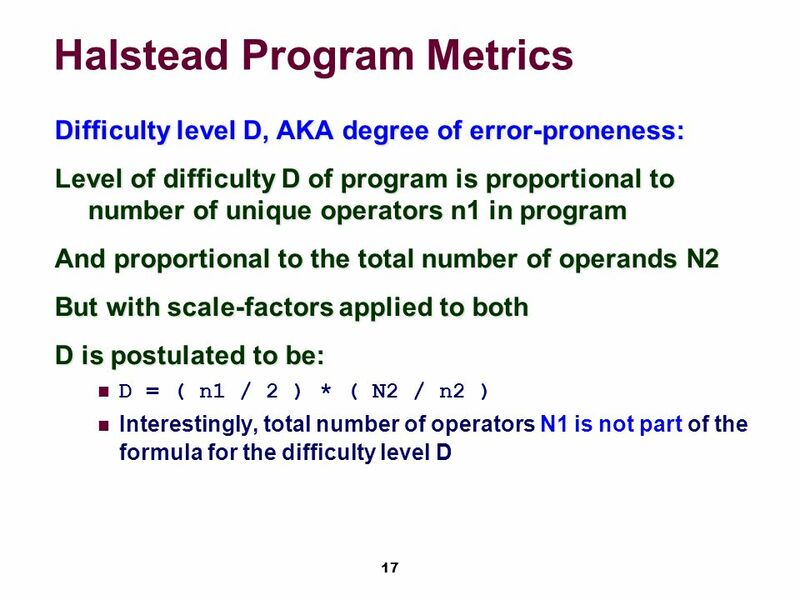 12 12 Halstead Program Metrics Halstead’s metrics count operators and operands in source code of program being analyzed number of unique (distinct) operators (n1) number of unique (distinct) operands (n2) total number of operators (N1) total number of operands (N2) Number of unique operators and operands (n1 and n2) as well as the total number of operators and operands (N1 and N2) are calculated during lexical analysis of source program Other Halstead measures are derived from these 4 units but without proof or scientific derivation! 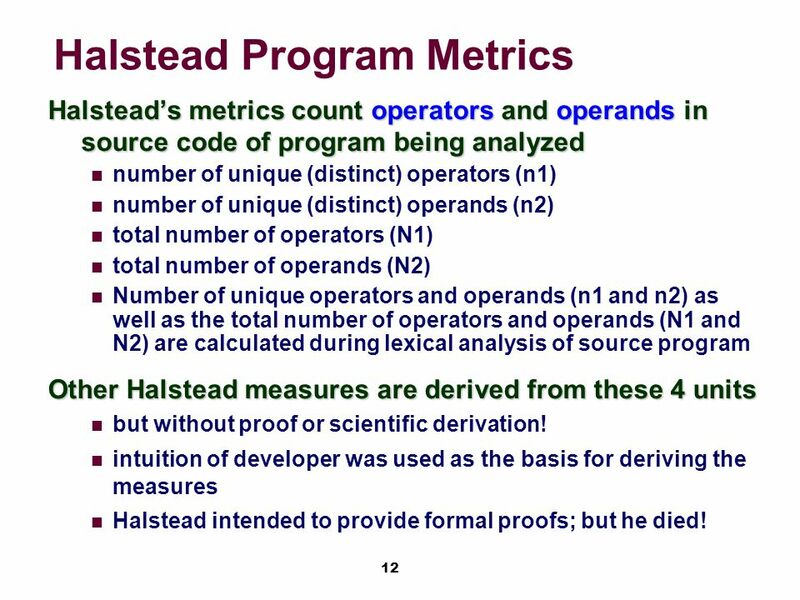 intuition of developer was used as the basis for deriving the measures Halstead intended to provide formal proofs; but he died! 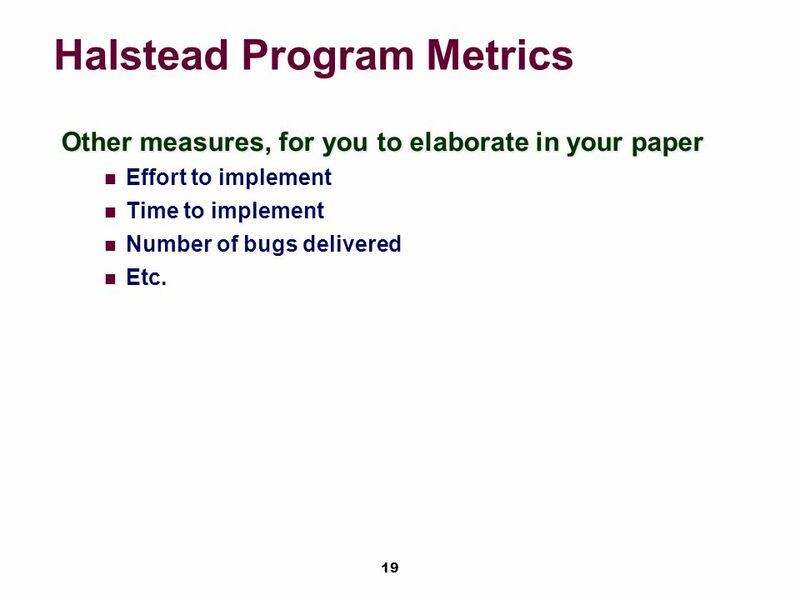 19 19 Halstead Program Metrics Other measures, for you to elaborate in your paper Effort to implement Time to implement Number of bugs delivered Etc. 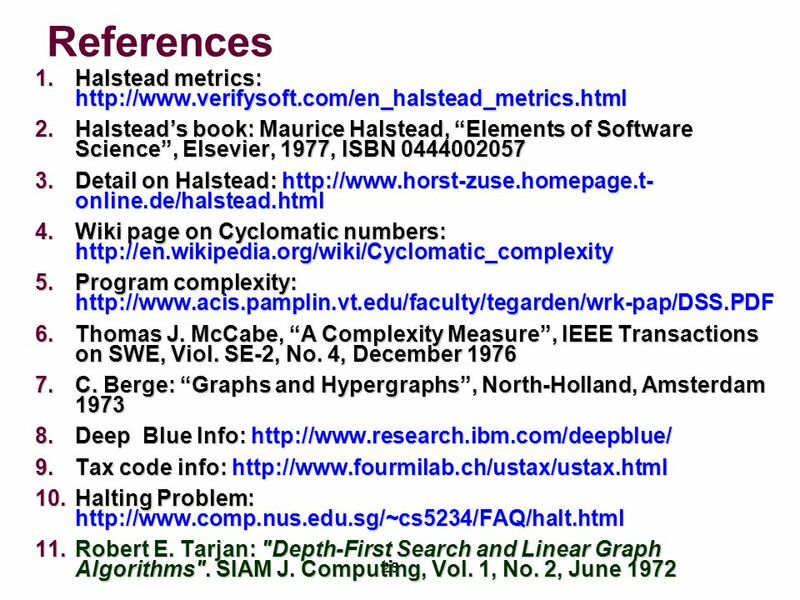 Download ppt "1 CS 410 / 510 Mastery in Programming Chapter 3 Program and Language Complexity Herbert G. Mayer, PSU CS Status 7/4/2013." 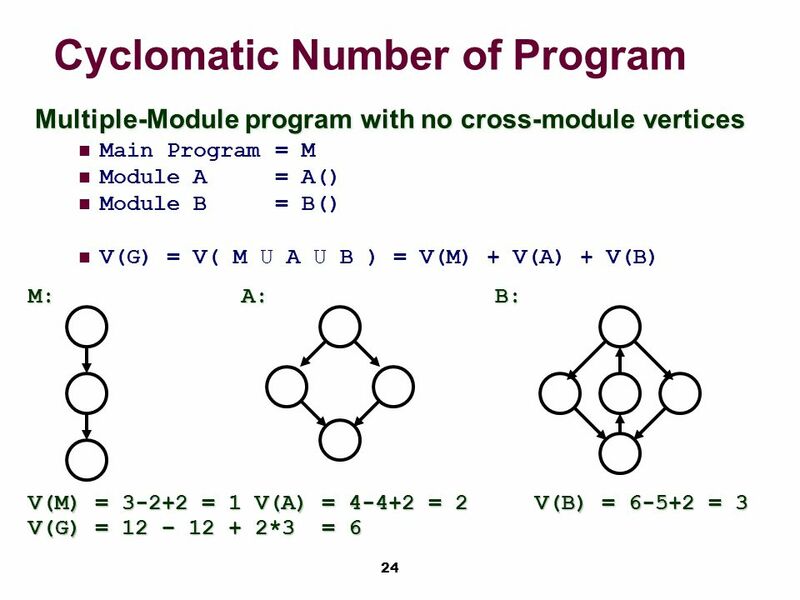 1 CSC 221: Computer Programming I Fall 2006 interacting objects modular design: dot races constants, static fields cascading if-else, logical operators. 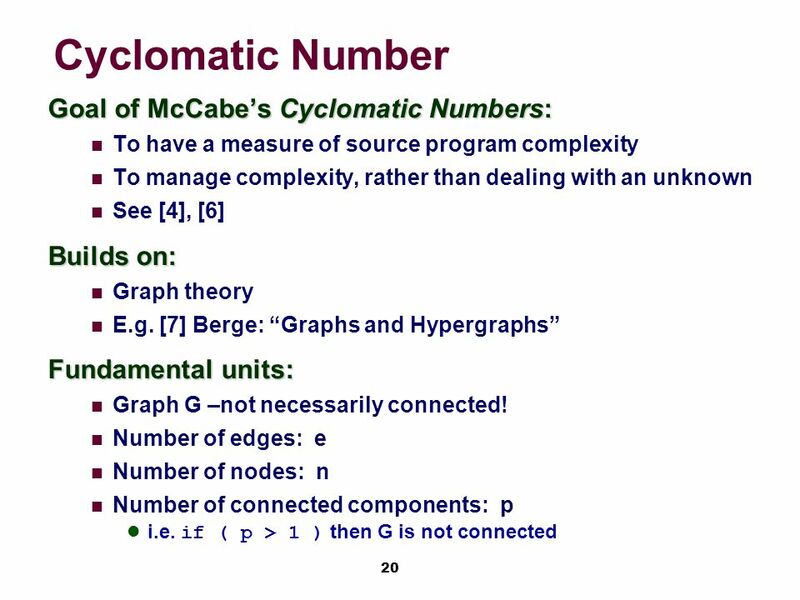 1 Lecture 16:User-Definded function I Introduction to Computer Science Spring 2006. 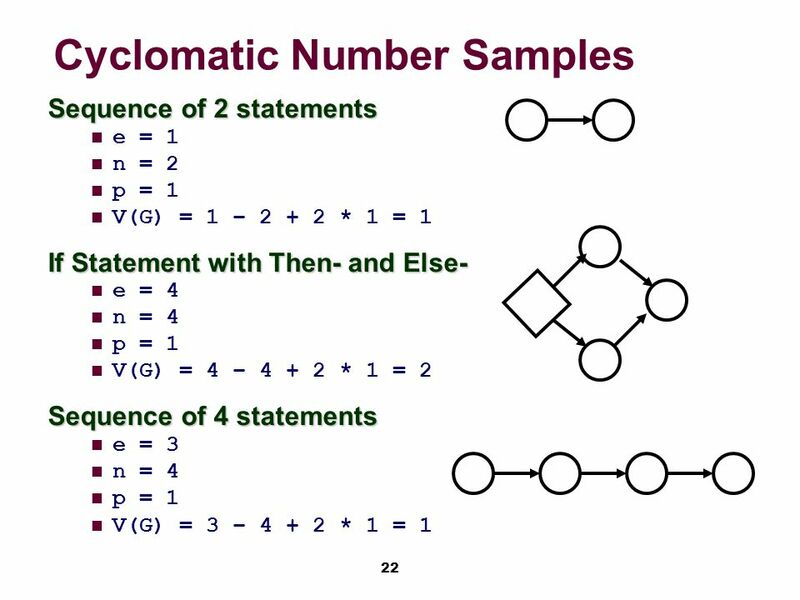 Evaluation of Abstraction Techniques. 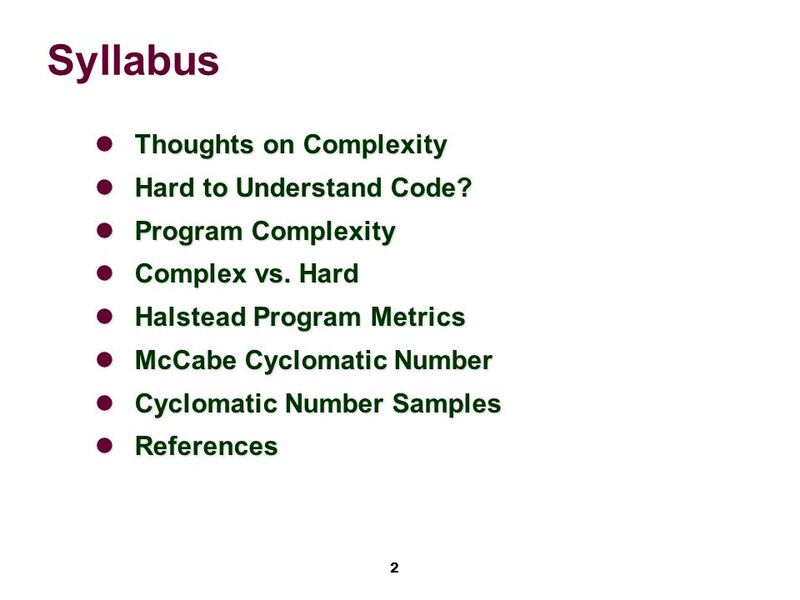 Uses for the complexity metrics in our framework Comparing the complexity of the reference model with the abstracted. Chapter 3 Flow of Control Copyright © 2010 Pearson Addison-Wesley. All rights reserved.